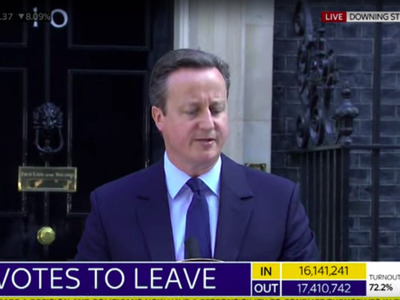 Sky newsPrime Minister David Cameron, announcing his resignation following Britain’s vote leave the EU. The number of British people Googling “getting an Irish passport” spiked by over 100% on Friday morning after the country voted to leave the EU, according to Google Trends. With the official vote now in, the Leave side won by 51.9% — which translates to 17,410,742 votes. The country is massively divided, with only London and a few scattered areas outside of the city voting for a majority Remain. The result has clearly made a lot of people worried enough to think about emigrating to Ireland, which is still in the EU and is enjoying economic strength right now. The UK, conversely, is in economic turmoil, with banking stocks crashing by as much as 30% and the pound falling about 6% against the dollar. The confusion of the UK’s immediate future following the referendum result was increased when Prime Minister David Cameron, who campaigned for Remain, announced his resignation. Talk has immediately turned to who will be the next Conservative leader, with bookmakers placing the shortest odds on Leave campaigner Boris Johnson, followed by Theresa May and Michael Gove.